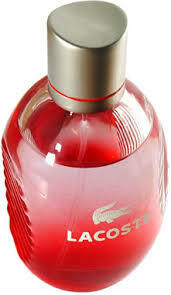 Lacoste Style in Play was an aftershave that came into my collection purely by chance. A friend who shall remain nameless who works at a well known airport offered me a number of unboxed and unused testers. Naturally I jumped at the chance. 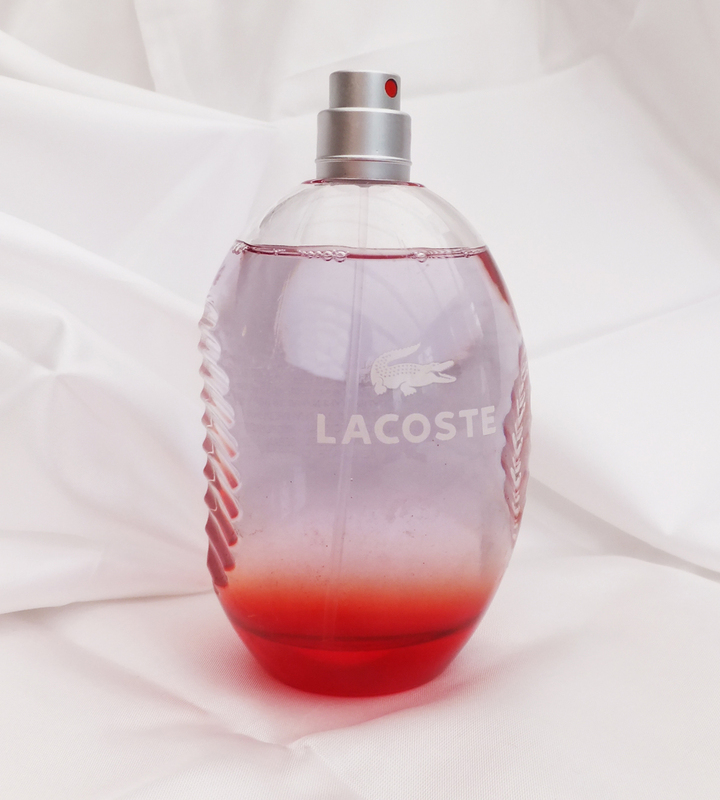 In my early twenties I was a big fan of Lacoste Booster and had no hesitation in relieving her of this bottle after a quick whiff. Launched in April 2004, Style in Play is a sporty fragrance that was marketed as an aftershave that contrasted purity and intoxication. Although I had seen adverts for this in most male lifestyle magazines at the time, I hadn't actually seen it in any shops and indeed when searching out a replacement bottle had to venture online as I couldn’t find it in any shops. Available in 75ml and 125ml bottles, a 125 ml bottle of Style in Play will set you back in the region of £30 (this is where I gloat and confess I paid £5 for a full bottle). The first thing to strike you about this product is the unique design of the bottle. Not only does it look the business, it is extremely functional with moulded ridges within the sides of the bottle making it easy to grip and apply. Dry Down: Patchouli, vetyver and musk oil. From the notes I would have expected a fruity, tangy fragrance that was light on application drying down to a heavier warmer fragrance that retained elements of the fruity top notes however I was pleasantly surprised. When first spraying this I found that the first three squirts produced no results whatsoever! Was I spraying myself in water?!? Four more squirts later and it was clear that the fragrance did not have base alcohol contained within it, instead this uses water making it extremely fresh and unlike most aftershaves it does not have an instant chemical aroma on first application. It also doesn’t have any burn at all after shaving thanks to the lack of alcohol. As the fragrance blends you start to detect hints of crisp green apples and are indeed the overriding fragrance, no other notes immediately come to the fore. Despite the very liberal application the fragrance is very light, and only just noticeable and it was an actual struggle for me to smell the fragrance on myself after around half an hour. The fragrance I had applied to my wrists (in the interests of research) changed considerably however it didn't at any stage get any heavier on my senses, if anything it seemed to get naturally sweeter. Cedar leaf was clear, but combined with the jasmine it was fresh and refreshing on par with the original Joop! Even the undertone of fresh pine did nothing to make this any heavier on the nose. After around an hour there was very little difference in the fragrance, the patchouli and vetyver were nowhere to be smelt however the more refreshing vibe had gone, leaving a clean and refreshing essence that remained clear throughout. It was wonderful, fresh apples combined with jasmine and hints of musk oil to give it that masculine edge. Although I struggled to notice the fragrance when wearing it I do get lots of compliments. The fragrance seems to linger and I'm reliably informed that it still can be smelt by all day long - result! Style in Play is one of those fragrances that blurs the line between perfume and aftershave. It has musk oil that as I have stated earlier gives it that masculine edge, but if you are looking for a light fruity fragrance that is sweet on the nose and remains evident to those around you hour after hour then this is for you. Personally I love Style in Play, and I find it suitable for daywear, casual wear and nights out and after my cheap sample I couldn't wait to purchase a larger bottle that has lasted for well over 6 months. At £30 for a 125ml bottle this is a fragrance I would recommend to all as good value for money. If you like Joop, Acqua di Gio, CK One or CK Truth you will adore Style in Play. If your favourites include Fahrenheit, Old Spice, 1881 or Caroline Herrera EDT this is something that will not really appeal. Years ago I really fell in love with a Lacoste fragrance which I can't remember the name of now (it was a green bottle) but I remember how I used it non-stop for months until one day I realised that it just doesn't last, even though I desperately wanted it to. Since then I never explored any of their other fragrances so its good to read reviews like this.